Be the first to share your favorite memory, photo or story of Carmella. This memorial page is dedicated for family, friends and future generations to celebrate the life of their loved one. 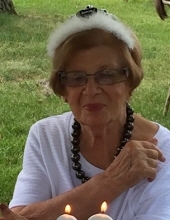 Carmella R. Cuozzo, 91, passed away on Monday, March 25, 2019 at Cornell Care & Rehabilitation Center in Union, NJ. She was born and raised in Newark, NJ and was an original Down Necker. After leaving Newark, Carmella resided in Belleville for 22 years. Carmella was a Secretary for RCA Corp of Harrison, NJ for 40 years, retiring at the age 65. She then worked for the City of Newark - Department of Vital Statistics for 8 years. Mela was the Secretary for Our Lady of Mt. Carmel Church, Newark for 15 years where she was Past President of the Rosary Society and a volunteer for the Annual Feast. Daughter of the late Joseph and Della (nee Orgo) Cuozzo; dear sister of the late Anthony and Marie Casale; also survived by dear nieces and nephews. The visitation for Carmella will be on Wednesday, March 27th from 9- 10 am at the Buyus Funeral Home at 426 Lafayette Street, Newark, NJ. Thence to Our Lady of Mt. Carmel Church, Newark, NJ where at 10:30 am the Funeral Mass will be offered. Interment Holy Cross Cemetery, North Arlington, NJ. Relatives and friends are welcome to attend. In lieu of flowers, donations to Our Lady of Mount Carmel Church 259 Oliver Street., Newark, NJ 07105 would be graciously appreciated. To send flowers or a remembrance gift to the family of Carmella R. Cuozzo, please visit our Tribute Store. "Email Address" would like to share the life celebration of Carmella R. Cuozzo. Click on the "link" to go to share a favorite memory or leave a condolence message for the family.